Let’s talk about the color white for a moment. There’s always some kind of rule when it comes to when it’s okay to wear white. Like no white after labor day…who made that silly rule up anyways!?! I think white is a classic color that should be worn all year long. And you know what else…I say wearing white on white is totally acceptable too. *GASP* I know, I know. It seems kind of crazy. You may ask but isn’t that too much of one color? Won’t it look blah or bland? Not at all but there’s a trick to it. Here’s a few tips so you can feel confident in pairing a white on white ensemble. * Use pieces that have different textures. This helps break up the look to not make it all run together. Example: If you’re wearing white denim, try pairing it with a white lace top. * Another great way to achieve this look is by using variations of white. Example: For my look I incorporated an off white sleeveless shawl. This breaks up the whites just a bit + it gave some added texture = DOUBLE WIN! 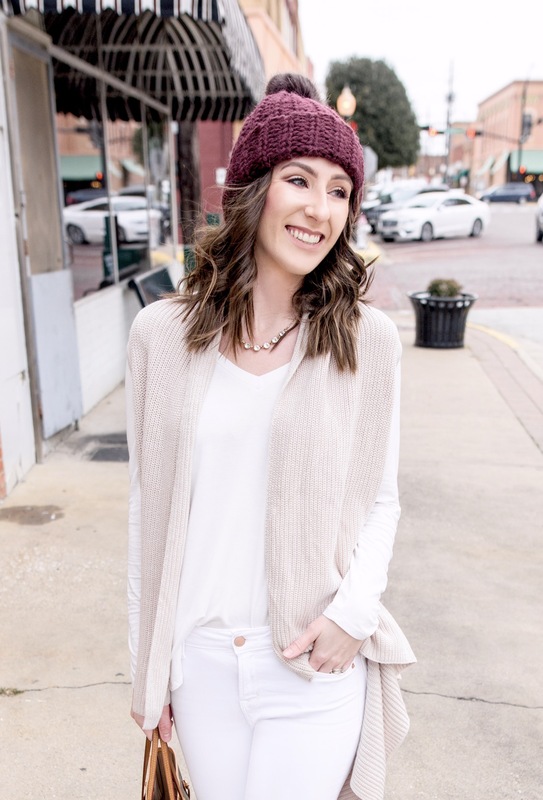 * If you’re not ready to make the full jump into a completely neutral white look, don’t be afraid to use accessories with color. A printed belt, a bright statement necklace, a colorful hat, or even a handbag in a fun color. 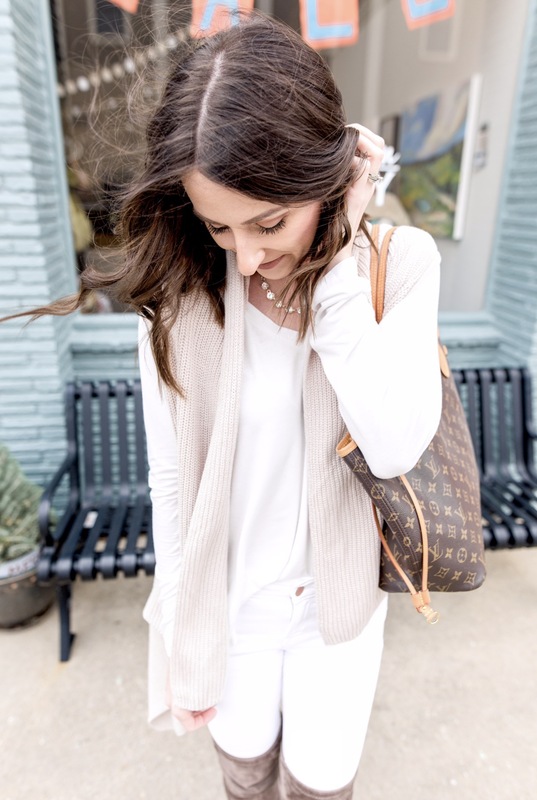 I hope these tips help you and you give the all white look a try! If you do, tag me on Instagram @FashionablyAlly so I can see how you rocked a white ensemble. Lauren you could totally rock them! I used to feel the same but now I wear them all year and are my go to. 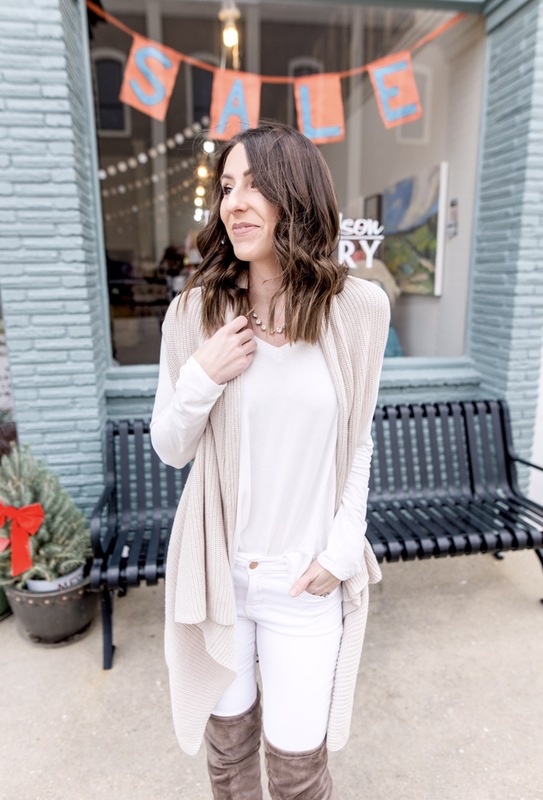 I LOVE this outfit & am also a fan of wearing white year-round! I love mixing shades of white! It’s clean & refreshing! Yes! White creates such a clean and classic look. Well done! I love that sleeveless cardigan too. I’ve always thought an all-white look is chic and classic! Very pretty! Beautiful! Love these photos and how you styled your outfit! This just gave me a bunch of ideas! Thanks girly! 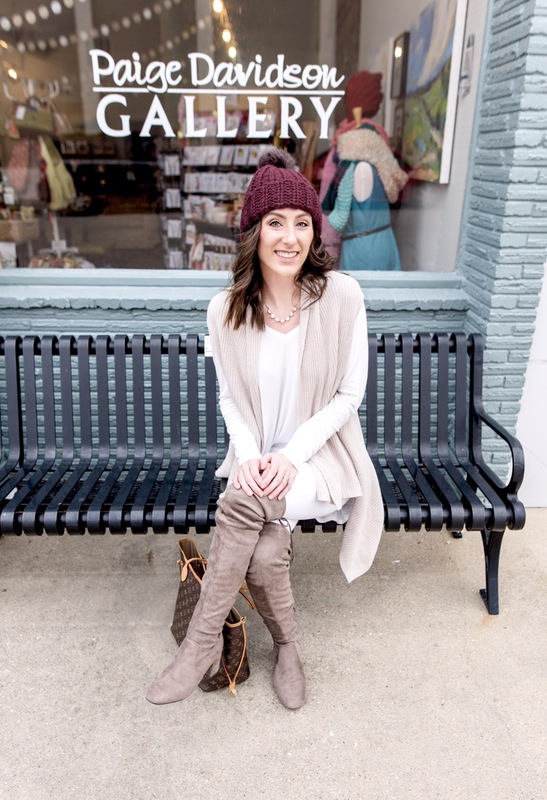 I am neutral-obsessed, so it was great to learn about the various ways I can style my outfits! You are just too fab! Really like the winter neutral idea. Looks amazing on you. Such a cute outfit, Love the neutral tone on you. Omg you’re so sweet! Thank you! Thanks so much! Neutral tones are fun during winter! Those are some fab boots! I still don’t own over the knees boots. I need to fix that!